Herringbone Leaf or Algerian Eye stitches are fun to use, but can be tedious to keep drawing. With the custom stitch feature, you don’t have to. 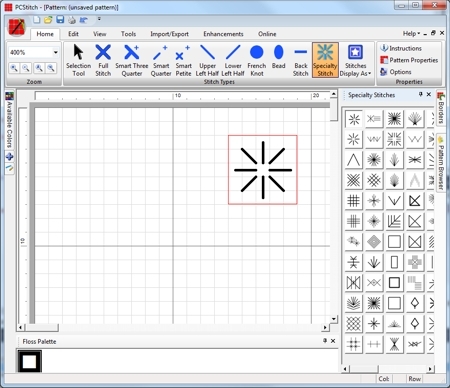 Custom stitches are a collection of stitches and backstitch lines that make up a complete stitch. When you drop them in your patterns, the drop using the current floss (like regular stitches), but you get the entire design. They are objects, so you can select, move or delete them as an individual item. Creating a custom stitch is as easy as drawing it once and putting it into the collection. 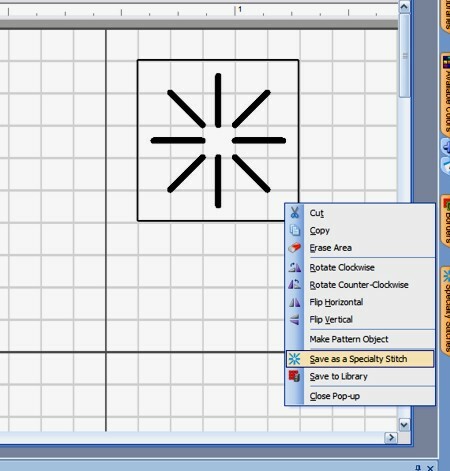 Just draw an edit box around your stitch, right click it, and select the menu option to save it as a specialty stitch. It is just that easy. Remember, when you drop it into future designs, the entire stitch will be dropped using the current floss color in the future design.